Accra – In September 2018, the International Organization for Migration (IOM) in Ghana trained 317 Community-Based Surveillance (CBS) Volunteers in the Northern Region of Ghana to identify and promptly report specific health risks in their communities that could spread as a result of human mobility. By notifying local health authorities when outbreaks of disease occur, CBS Volunteers (CBSVs) play a strategic role in Ghana Health Service’s Integrated Disease Surveillance and Response Strategy. While CBS has been employed in Ghana since the late 1980s, IOM has modified its trainings in response to the recent West African Ebola epidemic. The volunteers are now encouraged to shift from case-based monitoring and reporting to events-based reporting. Rather than focusing on individual cases of illness, events-based reporting targets patterns of events that may indicate proneness to future epidemics in a community. IOM’s revised module is thus an early warning system to situations when two or more members of a household or neighbours begin to display similar symptoms. In total, since July 2017, 930 CBSVs and 163 supervisors have been trained across five regions of Ghana. Training locations were selected based on proximity to borders – either international borders or those between regions in Ghana. The most recent trainings took place in Yagaba, the capital of Mamprugu Moagduri district in the Northern Region. Mamprugu Moagduri shares borders with the Upper East and Upper West Regions of Ghana. Abdulai S. Abukari has been serving as CBSV for years in this district. In 1998, he reported a cholera outbreak in his community by cycling 32 miles to the nearest health directorate in Walewale and crossing the White Volta River. Thanks to Abukari’s identification efforts and the subsequent treatment of the cholera patients, his community remained safe. After the new training provided by IOM, Abukari declared, “Now when I go on the street with my card, everyone knows we are also a part of Ghana Health Service.” Providing volunteers with identification improves volunteers’ visibility to members of the community, while also motivating the volunteers by recognizing the important role they play. 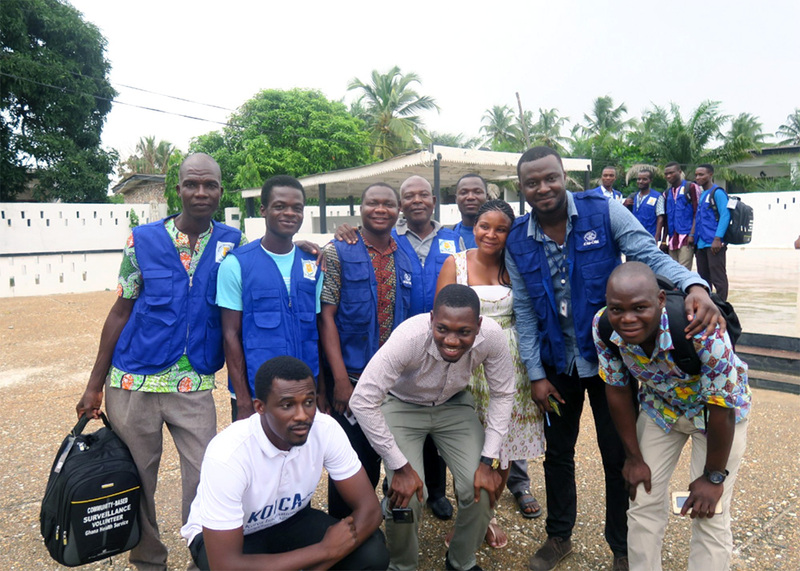 IOM Ghana’s CBSV training was piloted in the Ketu South District bordering Togo, in the Volta Region, and the Kassena Nankana West District, bordering Burkina Faso, in the Northern Region. The success of the pilot has resulted in Ghana’s Ministry of Health accepting to roll out the modified CBS module to more than 25 districts across the country. At present, the Jomoro District of the Western Region near Cote d’Ivoire, the Assin North District of the Central Region, and the Tatale Sanguli District of the Northern Region have all benefited from trainings. IOM Ghana’s modified CBSV trainings are supported by the IOM Global Health Security Agenda (GHSA) with funding from the United States Centers for Disease Control and Prevention (CDC). The GHSA was launched in Ghana in 2016 when five West African countries were chosen for its implementation.